این مقاله درصدد رسیدن به درک بهتری از رویکرد اقتصادی به تحلیل رفتار اعتیادی است. اعتیاد، مطابق با تعاریف استاندارد، یک رفتار مصرفی است که از الگوهای رفتاری مشخصی پیروی می‍کند. 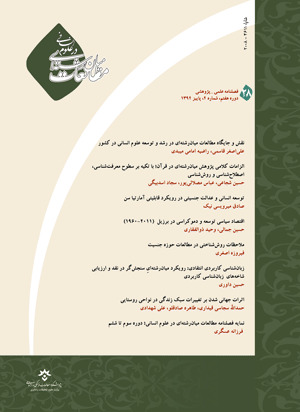 تحقیقات اخیر در علوم اعصاب نشان‌دهنده اتفاق‍نظرهای گسترده درمورد نحوهٔ تأثیر مصرف مواد اعتیادآور بر سازوکار‍های عصب‍شناختی دخیل در فرایند تصمیم‍گیری است. این یافته‍ها ــ‌که تحت حمایت الگوهای روان‍شناختی از رفتار اعتیادی قرار دارند ــ‌سبب شده است امروزه با اطمینان بیشتری از شناخت ماهیت اعتیاد بتوان سخن گفت. آنچه که از رویکرد اقتصادی به تحلیل رفتار اعتیادی انتظار می‌رود، توسعهٔ این شناخت به تدوین سیاست‍های مورد نیاز در حوزهٔ اعتیاد است. کاربرد علم اقتصاد بدین‌منظور ـ‌با تعریف معیارهای رفاهی تصریح‍شده برای مصرف‍کنندگان‌ـ به تجویز سیاست‍هایی منجر می‍شود که در میزان تحقق اهداف خود قابل ارزیابی و مقایسه هستند. در این میان اقتصاد رفتاری امکان مشارکت مفاهیم و بینش‍های تخصصی رشته‍های مرتبط با اعتیاد را در این مسیر فراهم می‍کند. ازاین‌منظر، مفاهیم کیفی روان‍شناختی و عصب‍شناختی مرتبط با رفتار اعتیادی، در چارچوب‍های کمّیِ تصمیم‌گیری مورد توجه قرار می‍گیرد تا به‍منظور کاهش آسیب‍های مرتبط با اعتیاد، سیاست‍گذاری با ابزارهای تحلیلی دقیق‍تر، و در عین حال جامع‍تری، دنبال شود. این مقاله به دنبال تبیین این موضوع است که چرا اقتصاد رفتاری یک چارچوب تحلیلی مناسب برای استخراج دلالت‍های سیاستی مورد نیاز در حوزهٔ اعتیاد است. Ainsile, G. (2001). Breakdown of will. Cambridge: Cambridge University Press. Ainslie, G. (2010). Money as MacGuffin: A factor in gambling and other process addictions. The Mechanisms of Self-Control: Lessons from Addiction. Oxford University Press. Anthony, J. C., & Helzer, J. E. (1991). Syndromes of drug abuse and dependence. Psychiatric disorders in America: The epidemiologic catchment area study, 116-154. Auld, M. C., & Grootendorst, P. (2004). An empirical analysis of milk addiction. Journal of Health Economics, 23(6), 1117-1133. Balleine, B. W., & O'doherty, J. P. (2010). Human and rodent homologies in action control: corticostriatal determinants of goal-directed and habitual action. Neuro psychopharmacology, 35(1), 48-69. Becker, G. (1996). Preferences and values. Accounting for Taste, Harvard University Press: Cambridge. Bernheim, B. D., & Rangel, A. (2004). Addiction and cue-triggered decision processes. American Economic Review, 1558-1590. Bernheim, B. D., & Rangel, A. (2005). From neuroscience to public policy: a new economic view of addiction. Swedish Economic Policy Review, 12(2), 99. Berridge, K. C., & Kringelbach, M. L. (2015). Pleasure systems in the brain. Neuron, 86(3), 646-664. Bickel, W. K., DeGrandpre, R. J., & Higgins, S. T. (1995). The behavioral economics of concurrent drug reinforces: a review and reanalysis of drug self-administration research. Psychopharmacology, 118(3), 250-259. Bickel, W. K., Yi, R., Mueller, E. T., Jones, B. A., & Christensen, D. R. (2010). The behavioral economics of drug dependence: Towards the consilience of economics and behavioral neuroscience Behavioral neuroscience of drug addiction (pp. 319-341), Springer. Biernacki, P. (1986). Pathways from heroin addiction: Recovery without treatment, Temple University Press. Bischof, G., Rumpf, H. J., Hapke, U., Meyer, C., & John, U. (2003). Types of natural recovery from alcohol dependence: a cluster analytic approach. Addiction, 98(12), 1737-1746. Camerer, Loewenstein, G., & Prelec, A. D. (2005). Neuroeconomics: How Neuroscience Can Inform Economics. Journal of Economic Literature, 43(1), 9-64. Commons, J. R., & Parsons, K. H. (1950). Economics of collective action. Culyer, A. J. (2014). Encyclopedia of health economics: Newnes. DSM-IV. (1994). Diagnostic and statistical manual of mental disorders (DSM). Washington, DC: American psychiatric association, 143-147. Dumont, F. (2010). A history of personality psychology: Theory, science, and research from Hellenism to the twenty-first century: Cambridge University Press. Erickson, C. K. (2007). The science of addiction: From neurobiology to treatment: WW Norton & Company NY. Evans, J. S. B., & Frankish, K. E. (2009). In two minds: Dual processes and beyond: Oxford University Press. Glimcher, P. W., & Fehr, E. (2014). Neuroeconomics : decision making and the brain (Second edition. ed.). Amsterdam Boston: Elsevier/AP, Academic Press is an imprint of Elsevier. Green, L., & Myerson, J. (2004). A discounting framework for choice with delayed and probabilistic rewards. Psychological bulletin, 130(5), 769. Grossman, M. (1995). 10 The economic approach to addictive behavior. The New Economics of Human Behaviour, 157. Gruber, J., & Koszegi, B. (2001). Is Addiction Rational? Theory and Evidence. Technology, 1261. Gruber, J., & Mullainathan, S. (2006). Do cigarette taxes make smokers happier? Happiness and Public Policy (pp. 109-146): Springer. Heather, N., & Segal, G. (2016). Addiction and choice: rethinking the relationship: Oxford University Press. Henden, E. (2016). Addiction, compulsion, and weakness of the will: A dual process perspective. Henden, E., Melberg, H.-O., & Rogeberg, O. (2012). Addiction: choice or compulsion? Frontiers in psychiatry, 4, 77. Henkel, D. (2011). Unemployment and substance use: a review of the literature (1990-2010). Current drug abuse reviews, 4(1), 4-27. Heshmat, S. (2015). Addiction: a behavioral economic perspective. New York, NY: Routledge, Taylor & Francis Group. Heyman, G. M. (1996). Resolving the contradictions of addiction. Behavioral and Brain Sciences, 19(04), 561-574. Heyman, G. M. (2009). Addiction: A disorder of choice: Harvard University Press. Hicks, J. (1979). Causality in economics. New York: Basic Books. Hoffman , J., & Froeke, S. (2007). Addiction: Why Can’t They Just Stop? : Emmaus, PA : Rodale Press. Holton, R., & Berridge, K. (2013). Addiction between compulsion and Choice. In N. Levy (Ed. ), Addiction and self-control: perspectives from philosophy, psychology, and neuroscience. New York, NY: Oxford University Press. INCB. (2013). International Narcotics Control Board: 2013 Annual Report. Kable, J. (2013). Valuation, intertemporal choice and self-control. In P. Glimcher & E. Fehr (Eds. ), Neuroeconomics, 2nd Edition (pp. 173-192): Academic Press. Kahneman, D. (2003). A perspective on judgment and choice: mapping bounded rationality. American Psychologist, 58(9), 697. Kahneman, D. (2011). Thinking, fast and slow (1st ed.). New York: Farrar, Straus and Giroux. Klingemann, H., Sobell, M. B., & Sobell, L.C. (2010). Continuities and changes in self‐change research. Addiction, 105(9), 1510-1518. Levy, N. (2013). Addiction and self-control: Perspectives from philosophy, psychology, and neuroscience, Oxford University Press. Loewenstein, G., & Thaler, R. H. (1989). Anomalies: intertemporal choice. The Journal of Economic Perspectives, 3(4), 181-193. Lubman, D. I., Yücel, M., & Pantelis, C. (2004). Addiction, a condition of compulsive behaviour? Neuroimaging and neuropsychological evidence of inhibitory dysregulation. Addiction, 99(12), 1491-1502. Maddux, J. E. (2015). Psychopathology: Foundations for a contemporary understanding, Routledge. Massing, M. (2000). The fix, Univ of California Press. McClure, S. M., Laibson, D. I., Loewenstein, G., & Cohen, J. D. (2004). Separate neural systems value immediate and delayed monetary rewards. Science, 306(5695), 503-507. McKim, T. H., & Boettiger, C. A. (2015). Addiction as Maladaptive Learning, with a Focus on Habit Learning. The Wiley Handbook on the Cognitive Neuroscience of Addiction, 539. Nestler, E. J., & Malenka, R. C. (2004). The addicted brain. Scientific American, 290(3), 78-85. Politser, P. (2008). Neuroeconomics: A guide to the new science of making choices, Oxford University Press. Potenza, M. (2015). Perspective: behavioral addictions matter. Nature, 522(7557), S62-S62. Quenqua, D. (2011). Rethinking addiction's roots, and its treatment. New York Times, A11. Rachlin, H. (2003). Economic concepts in the behavioral study of addiction. Choice, Behavioral Economics and Addiction, 129-149. Radu, P. T., & McClure, S. M. (2013). Neuroeconomics and Addiction: Integrating Neuroscience, Cognition, and Behavioral Economics. In P. M. MILLER (Ed. ), Biological Research on Addiction: Comprehensive Addictive Behaviors and Disorders (Vol. 2). Amsterdam ; New York: Academic Press (Elsevier). Robins, L. N. (1993). Vietnam veterans' rapid recovery from heroin addiction: a fluke or normal expectation? Addiction, 88(8), 1041-1054. Robins, L. N., Davis, D. H., & Goodwin, D. W. (1974). DRUG USE BY US ARMY ENLISTED MEN IN VIETNAM: A FOLLOW-UP ON THEIR RETURN HOME. American Journal of Epidemiology, 99(4), 235-249. Satel, S., & Lilienfeld, S. O. (2013). Addiction and the brain-disease fallacy. Frontiers in psychiatry, 4, 141. Simon, H. A. (1979). Rational decision making in business organizations. The American economic review, 493-513. Skog, O.-J. (1999). Rationality, irrationality, and addiction. Notes on Becker and Murphy’s theory of addiction. Getting hooked. Rationality and addiction, 173-207. Skog, O.-J. (2003). Addiction: Definitions and mechanisms. Choice, Behavioral Economics and Addiction, 157-175. Trosclair, A., Huston, C., Pederson, L., & Dillon, I. (2002). Cigarette smoking among adults--United States, 2000. MMWR. Morbidity and mortality weekly report, 51(29), 642. Veblen, T. (1898). Why is economics not an evolutionary science? The Quarterly Journal of Economics, 12(4), 373-397. Volkow, N. D. (2010). Drugs, brains, and behavior-the science of addiction. Retrieved on March, 23, 2011. Wiers, R.W., Field, M., & Stacy, A. W. (2016). Passion’s slave? Conscious and unconscious cognitive processes in alcohol and drug abuse. The Oxford handbook of substance use and substance use disorders, 1, 311-350. Wilson, S. J. (2015). The Wiley Handbook on the Cognitive Neuroscience of Addiction, John Wiley & Sons.